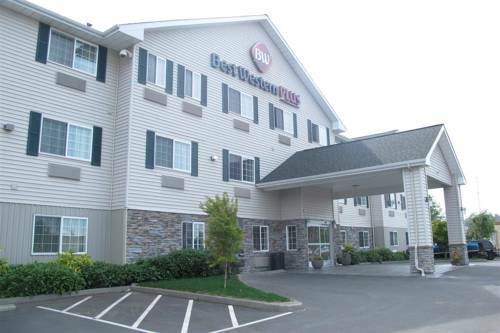 The newly renovated Best Western Plus Aberdeen is located adjacent to the Chehalis River in the quaint downtown area. Enjoy the convenience of staying in the largest city in Grays Harbor County and just a 20 mile scenic drive from Ocean Shores. This Best Western has been recently renovated and the only hotel in town that has a pool and is serviced by either Seattle-Tacoma International Airport or Portland International Airport. Enjoy being within walking distance to the shopping mall and fast food restaurants. From: Seattle. Take I-5 South then take the 101 South then take the 8 West then take the 12 West until you get to Aberdeen. Turn left on S. Kansas Street. You will see the Best Western Plus Aberdeen from Highway 12. From: Portland, OR. Take I-5 North to Highway 12 West until you get to Aberdeen. Turn left on S. Kansas Street. You will see the Best Western Plus Aberdeen from Highway 12. From: Port Angeles. Take the 101 South until you get to Aberdeen. Highway 101 becomes N. Park Street then E. Heron Street. Stay on E. Heron Street until you see the Best Western Plus Aberdeen on your right. 20 mile(s) from Quinault Beach Resort and Casino, features 158 rooms at their seaside hotel and conference center in Ocean Shores, WA. The resort on the Olympic Peninsula is perfect for family vacations, business trips, and much more. Government-run Visitors Center features educational displays, including a simulated magma chamber that you can walk through.